Pete Gallego, former one-term U.S. House of Representative from Texas’ 23rd congressional district wants your vote. The Alpine native also served in the Texas House of Representatives 74th District from 1991 to 2013. Of course, anyone running for office wants votes but during an interview with Big Bend Gazette Publisher John Waters, over breakfast burritos at Magoo’s Restaurant, in Alpine, Gallego elaborated on how close the 2014 election was. Then-incumbent Gallego was defeated by Republican challenger Will Hurd. 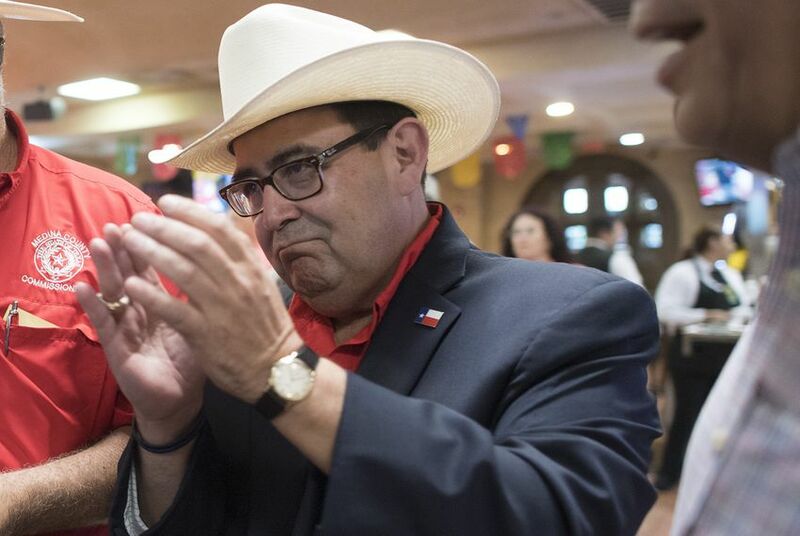 Out of 115,429 votes cast, Hurd won by just 2,422, a margin Gallego is hopeful he will overcome this fall and thereby return to Washington, D.C. in the U.S. House of Representatives. “This year, in a presidential cycle, I’m feeling pretty good because the dynamics of a presidential cycle are different.” Typically voter turnout is far higher in presidential election years. BBG: In June, Trump criticized U.S. District Judge Gonzalo Curiel during a speech he gave in San Diego, stating, ‘What happens is the judge who happens to be, we believe, Mexican, which is great, I think that’s fine.’ Trump later doubled-down on his comments during CNN interview with Jake Tapper, when he said, “He’s a Mexican; we’re building a wall between here and Mexico.” Tapper corrected Trump and said Judge Curiel was born in Indiana. Gallego: Does [Trump] really mean that? It’s pretty horrific. The comments about the federal judge in California, I can’t tell you how that resonates…. A lot of times, people tell me they don’t vote because it doesn’t matter. But this time, it matters. BBG: Are you hearing that across the board or is that from Latino voters? Gallego: I’m hearing that in particular in Latino neighborhoods where turnout has traditionally been very low. I don’t think it will be low this time. I am also hearing it across the board. I think people are generally appalled by the nature of the comments because it doesn’t just impact Latinos. If you tell somebody, you can go to school, you can get educated, you can bust your rear-end, but at the end of the day the only thing that matters is who your parents are and what they did and where you are from. That’s what Trump said. And when he said that, he didn’t just apply it to Latinos; that applies across the board. In essence, the perception is he is willing to steal the American Dream from anybody that he doesn’t think is good enough. It reminds me of the line from [George Orwell’s book] Animal Farm: “Everybody is equal, but some are more equal than others.” Trump thinks that some people are more American than others. BBG: What are the three counties? Gallego: El Paso, Maverick and believe it or not, Brewster. Registration here [in Brewster County] is up in a very big way. We’ve worked really hard to get registration up. We’re working really hard…. All of the data we’ve seen, all of the data that we are tracking all looks really good. My name identification is high, positives are high, everything is going well. The only area where Will [Hurd] consistently beats me and continues to beat me is money. His PAC [Political Action Committee] support is up over 450 percent because they are pulling out all the stops at the national level. BBG: What do you think of Mr. Trump’s idea of a border wall? Gallego: It’s offensive and dumb. He clearly doesn’t understand the relationships along the border. Whether it’s the trade issues or the history that we have. There are so many Mexican citizens in San Antonio who are also dual citizens and they are all fired up. They genuinely believe that Trump is racist and that it is particularly directed at Mexico. I got along really well with George W. Bush when he was governor. I used to worry because Bush was making a concerted effort to bring Latinos into the Republican Party, arguing that they were a natural constituency and as a result, for a while, you saw a lot of Latinos doing that. I don’t worry about that so much anymore. I think Trump will be gone by tomorrow; after November, Trump is done. But the perception he has created of the party, because the party choose him, he is the party’s [presumptive] nominee. The perception he has created is they are anti-Latino. And so the mind of the Latino community to join the Republican Party is going to be a very sore point. Do you remember the Pace Salsa television advertisement? Gallego: That’s the reaction. Around here, the Republicans are thinking, that [Trump] is not someone we have anything in common with, he’s not our guy. It really is like that…. Gallego: He lives at his parents’ house. Which is not far outside of the district, maybe two miles outside of the district. He’s never bought a place. He moved in with his parents to run. BBG: How do you get the vote out? Gallego: When I am home I go to the [Catholic] mass in Alpine, but a lot of the time I go to the 8 am mass in Marfa. There has not been a time when I have been home when somebody does not come up to me and say, “I’m so sorry; you had opponents before every year and you always won, so I didn’t vote.” [Gallego served in the Texas House of Representatives 74th District, from 1991 to 2013.] “We thought you were going to win and we didn’t know you needed us and we didn’t vote.” If it happens once or twice, it’s anecdotal. But when it happens every single day, it gets to the point where it’s somewhat comical now. People in West Texas used to tell me “There’s no way you can do this. This district is a San Antonio-based district and every congressman has lived in San Antonio. And nobody from a small town has ever been elected, so you can’t.” But now we see you can do this. It’s a completely different attitude and level of engagement. I think you are going to see turn-out in Alpine, and Marfa and Fort Stockton and Del Rio; the places where I represented in the state 74th District, they’ll have turn out. I’m excited; I think it will turn out well. BBG: Are you for or against the TransPecos Pipeline? Gallego: I’ve been opposed to it. But my reason might be different from everybody else’s. This is the last, most pristine part of the state and I’d like to keep it that way. If you build one, others come. I’ve represented a lot of areas that have pipelines and pipelines are important. They are a way of life, they have helped our way of life in the movement of fuels that we need and those kind of things. But, I’d rather not have that started in our part of the world. I understand the market economy and I understand oil and gas in this area. I am hopeful there are easier places to look for oil and gas than the Davis Mountains, TransPecos region of Texas. Having grown up here I want Nicolas [my son] to jump over the same rocks that I jumped over and to be able to see the same things that I saw, and to be able to play in the places that I played. It really is a question of finalizing and protecting the region of the state I love so much. BBG: Mr. Hurd co-authored legislation that would have built many miles of roads in Big Bend National Park. Can you comment? It’s an incredible place. I was stunned that was the first bill that Mr. Hurd signed onto, because the bill tells Customs and Border Protection, the Department of Homeland Security to move all their assets to the front line, which is the border. [The bill] also says it doesn’t apply to state land or privately-owned land. So, it doesn’t apply to private property and it doesn’t apply to state property. So that leaves out the Big Bend Ranch [State Park], that leaves out the Bright Ranch. So if it only applies to federal land—well, what federal land is there on the border [of the national park]? That’s easy, just look at a map, there is a big chunk of federal land on the border. And what was even more problematic was that bill specified the minimum requirements. It specifies three forward operating bases built in the Customs and Border Protection Big Bend Sector. So, where’s the federal land in the Big Bend Sector? If this is a border security bill and you’re putting all your assets on the border, where is the federal land on the border? Again, Big Bend [National Park]. So it required three forward operating bases and it tells you what a forward operating base has to have. A forward operating base has to have detention facilities for prisoners, it has to have a helipad. Factor in the square footage that’s required for a helipad and holding facilities, and for office facilities and vehicle maintenance facilities,? This is a heavy footprint. The other thing is it waived every single environmental statute, whether it was the Wild and Scenic River Act, the Endangered Species Act, all of that stuff—and pushed it aside in order to build these forward operating bases. In addition to the three forward operating bases, the bill called for connecting the bases with two hundred miles of new roads. Really, in Big Bend National Park? That’s how [Hurd] started, and then he voted to shut down our Amtrak station. It hasn’t gotten any better. His voting record is a 96 percent straight Republican voting record; I think he has [since] lowered it since I started talking about it. I’m also a big proponent of taking care of our veterans. One of the reasons I worked so hard on the [Veteran’s Administration] and health care reform and the provisions for vets being able to go to a local doctor is because we have so many veterans here and the nearest V.A. facility is far, far, away. If you can go to a local doctor you strengthen our ability to be able to attract and retain more health care professionals because you have a bigger patient base. BBG: Brewster County recently received its annual Payment in Lieu of Taxes (PILT) from the federal government: that was $1.2 million. Are you an advocate of PILT? Gallego: We wouldn’t make it with out that. That PILT money is incredibly significant. If that goes away, [we’re] in a world of hurt. [On getting out the vote:] We create an environment where people feel left out if they didn’t vote. We have 26 local offices set up. Every election is important. I believe that. But some are pivotal. I would equate it historically to the pivot from Herbert Hoover to F.D.R. [Franklin Delano Roosevelt] and how that changed the trajectory of the country completely. This is a pivotal election. If we pivot in the direction Donald Trump would like to go, that’s a huge, huge turn from where the country has ever been. We need to let people know what is at stake for them. What we need to think about is that change doesn’t come overnight. It changes for the next generation. I think about my grandfathers: they grew up on homes with no running water. Then I think about my little boy. That progress from my grandfathers’ generation to my father’s generation to me and to my son—we have to continue that progress. That’s the American Dream. We have to keep that American Dream alive for our kids and our grandkids. When you put it in those terms to people, I think it incentivizes them to vote. Publisher’s note: The Gazette has contacted Justin Hollis, campaign manager for [Will] Hurd for Congress, and has also offered Mr. Hurd the opportunity for an interview.